Cost? Experience required to cobble this together? Sounds intriguing. > Cost? Experience required to cobble this together? Sounds intriguing. So far less than $100, as promised, but you have to be experienced with the soldering iron and circuit construction. Yes, intriguing because these XBee devices are really amazing: postage-stamp sized 2.4GHz modem transceivers that transparently extend serial connections throughout the house! My 1-milliwatt pair have now been chugging away for about 16 hours now without a hiccup, delivering my VUE station reports to APRS/CWOP. Here's how I did it. First, the easy part. This is what it will look like when it's running. The red/green status lights are nice, green blinks whenever a record is received wirelessly from the VUE console! Now the console-side transceiver. Good news: it will be cheaper because we'll build it from inexpensive parts, plus another $22 XBee Modem. But it will of course be more difficult to put together. Don't attempt this unless you have a fine-tipped soldering iron and some building experience. We'll use the SparkFun XBee breakout board ($3) and a pair of 2mm header sockets ($1 each) which need to be soldered to the breakout board for mounting the XBee transceiver ($22, same as above). 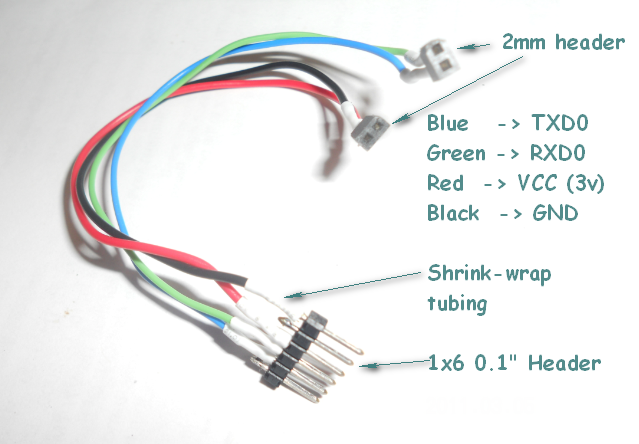 Buy an extra header socket, which will be cut up to make the console connector cable (details in previous Phase I posting). You'll also need some 0.1" spacing PC board (PCB) and a six-pin 0.1" header for the console connector. I had some of these pieces laying around, but you can get them at SparkFun or Radio Shack. Typically you buy oversized pieces and cut them to size. Shouldn't cost more than a few bucks I would guess. Note that TX _output_ goes to XBee _input_ etc. Most common wiring errors occur here. Also be careful with the soldering iron. It's incredibly easy for solder to "bridge" across pins if you're not careful. Inspect all work with a magnifier before applying power! The final hardware step is to build the connector cable, essentially the same cable as constructed in Phase I. If you've done this then all you have to do is connect the red wire to the Vcc 3v connection and you're ready to go. (Don't forget the shrink wrap. I'll guarantee short circuits if you don't use it. Cheap to buy (Radio Shack etc) and easy to apply (hair dryer etc)). The last step is to configure the XBee modems for operation at 19200 baud. The default setting is 9600 baud. Download the excellent X-CTU utility from Digi Corp to do this. Just plug the XBee's into the USB explorer and run the utility to set baud rate (also you can check out other parameters with this tool). Now you have a pair of transceivers. Plug the USB explorer into your destination computer and the homebrew unit into your console using the console connector. Next on the agenda, discussions about Phase III, custom PCB for making this available to the masses. Awesome job and, better yet, a very detailed writeup that others could follow (I know those take a lot of time to put together). It is great that others are going to be able to do this without removing a single screw on the console. I'll put a link to this on my blog if you don't mind. Have you determined if there will be an impact on console battery life by connecting up to Vcc rather than DC In? Maybe a switch or a jumper so you could easily choose between one or the other? Not yet, the XBee specs say it consumes 50ma @ 3.3v, which translates into 0.165 watt power consumption overall. It does indeed run on battery power (I tried it), but 50ma probably will cut the battery life in half (disabling the 3 LED's on the USB explorer [on the computer side] would help a bit). But I plan to run it from the wall wart most of the time. I'm going to put a quick-disconnect plug in the 3.3 volt line on the cable so that I can insert an ammeter and do some direct measurements to verify power consumption. Also will allow disonnecting the power if I want to use it with USB-COM interface (where it is internally USB powered). I did run it on the USB-COM with the extra 3volt line connected and it worked fine. But I think it would be safer to disconnect the power if you're not using it. You don't want two power sources bucking each other (in case one shorts out etc). I should make it clear that the console cable is a kluge, with those 2mm plugs hacked out of an XBee socket. Difficult to make and install, but it works and avoids having to open the case, as you pointed out. Is it worth making this thing? Sure, if you have the skills. It will probably be a month or so minimum before we have a custom board designed and available. I would like it to have both an XBee and a USB connector so that it could be used wired or wireless. It will have a custom 2x10 socket to plug right into VUE console. But there will be some design issues to solve. What features are needed? Let me know. I have virtually zero experience in the hobby weather arena. I've designed a couple of very simple circuit boards years ago, but none as complicated as this will be. > but it works and avoids having to open the case, as you pointed out. You're probably wondering why I didn't use 2x10 header receptable with 2mm pitch, instead of the kluge plugs? Well, they're hard to find (because 2mm is not very popular). Samtec makes them for $2.75 each, but the minimum shipping is $10. So, not wanting to go over my $100 budget (and also being cheap) I decided to make my own. Digikey carries it too, but they were out of stock, so I didn't want to wait on a back order. Ok my head is reeling a bit. You mean to say I could, with your setup, uncable my Envoy from my weather computer and have it stream the serial data via Zwave or Zigbee and have a wireless receiver at the pc to receive the data ? I could put my Envoy where I want and the computer where I want ? Why isnt Davis thinking of this ? You are doing one heck of a job !!!! I'm not sure what an Envoy is, but sounds like some wireless gadget. Yes, my circuit would replace that and the WeatherLink also. Plugs into the 20-pin socket at the bottom of the VUE (I'm told the VP2 has a similar connection). Then, acting as a virtual COM port (COM4 etc), allows a computer in range to see the remote console as a local serial device. So far it has been totally 'transparent' to the functionality of WUHU and CUMULUS, the only two programs I have tried. I'm a complete newbie at this weather game, but am handy with the electronics. And, yes, Davis is perfectly welcome to take this design and make it into a commercial product to fill that huge gap in their product line ("low-cost wired/wireless serial interfaces"). Hopefully, with a price tag around $99.95 (wireless) or $29.95 (wired). Here is the Envoy manual. Looks to me that the same solution applies, looking at Page 4 of the document. af4ex: It looks like Digikey has a few headers in stock now (6) for the outrageous price of $5.13. Look here. > data so there will be gaps. Actually, I've got that situation partially covered. I'm using a "discarded" Eee PC notebook (with a damaged LCD screen) as my weather computer. Uses a solid state drive, has WiFi within the house, and can run for about 6 hours on battery backup. So it looks like I will be dedicating it to weather related tasks, and will rarely need to shut it down (once I'm all set up). So far I've been able to keep it going for 5 days now, even while developing this wireless interface. Says here the Wireless Weather Envoy has been discontinued. Is there a replacment? The regular Envoy is essentially a VP2 console without a display. http://www.davisnet.com/weather/products/weather_product.asp?pnum=06316 is the most recent part number (for the last several years). I don't plan on buying a WeatherLink. That was the motivation for building this replacement. I could write my own logger I guess. Right now I'm letting APRS/CWOP do my logging. I suppose that will change as I learn more about these personal weather stations. Just another aspect of the hobby your having fun that all that counts, I've enjoyed readin the thread I myself already own a serial data logger wired so I don't plan on using your project. Keep lookin forward. That was a VP1 Envoy page, not a VP2 version. First of all say hello to everyone from Madrid (Spain - Europe). Second, congratulations and say thank you to AF4EX and DeKay for the information about the pinout of Davis port. Simply fantastic, very instructive, and very interesting. In the other hand, another doubt is, what are TxD1 and RxD1 (in the console port) for? Can we use them for something special. Sorry about my ignorance. I will try to make this project to connect mi Vantage Pro (the original, the VP1) to my computer in order to use some kind of special and compatible weather software like Cumulus or something like that. Thanks in advance for your requests and again, congratulations. Yes, it's correct, but I should have clarified more that the labels 'RXD0' and TXD0' refer to the _destination_ pins on the 20-pin connector. So the XBee _output_ goes to the 20-pin _input_ etc. FYI, my 1-milliwatt wireless XBee's are still running and sending data to APRS/CWOP, from downstairs to upstairs, about 20 feet direct path, through the ceiling. I carried the laptop around the house and found that the signal starts to fade at about 40 feet and going through several walls. There's a range test function in X-CTU for measuring signal strength etc, but I haven't used it yet. For 10 or 20 feet there doesn't seem to be any range issues. If you have to transmit further than 30 ft or so, through several walls etc, then you may to need use the 60mw transceivers. In the other hand, another doubt is, what are TxD1 and RxD1 (in the console port) for? Can we use them for something special. I don't know what they are for. They don't spit out anything during a console reset, and they don't respond like TxD0 and RxD0 do. It could be they are there for factory testing and that there is some hidden command to wake it up. Or maybe they were brought out to the expansion port "just in case" but never used. It would probably take a deep dive into the firmware to figure it out. Nothing I'd be interested in, because all the good stuff you'd ever need is already on TxD0 / RxD0. Using them for "something special" would mean you'd have to change the firmware to make it happen. Not impossible, but pretty hard without the actual Davis code. Very grateful for your requests. OK, now I see it. Understood. May be a detailed photo sowing the Vantage Vue expansion port with the wires conected would be very interesting. I will continue visiting this post with great interest. > wires conected would be very interesting. Maybe this will help to eliminate some confusion about the wiring. I have a weatherlink with serial output. As I understand it you are eliminating the weatherlink from the equation, which is cool. However, I'd like to retain it for its logging capabilities should the WXPC go down. In the very near future me and my VP2 will be relocating to a townhouse somewhere in the DC burbs. Methinks that they're not going to be to keen on me slapping a weather station in the side yard. I plan on finding a surrogate house in the area to foster my setup. Wireless transmission between the serial weatherlink and the netbook is going to practically be a necessity. > Methinks that they're not going to be to keen on me slapping a weather station in the side yard. > I plan on finding a surrogate house in the area to foster my setup. Digi makes higher power XBee chips, which SparkFun says have a range "up to 15 miles". But they don't mention you'd have to set up an outdoor antenna system to get that range. It's still only 100 milliwatts, less than those 1/2 watt Citizen Service walkie talkies. A more practical solution would be to pipe the data over the internet. It's only 19.2K baud so a regular high-speed cable should have the bandwidth. There's probably remote logging software available to do that or you could write your own. Conceptually very simple, just set up a two-way socket (IP address + port number) and read and write to it like a file. Or if you would settle for 'near real-time' performance, just spool the data to a file, and do a file transfer several times a day. I finally got Cumulus working, so have switched to that from WUHU. It seems to have some logging capabilities. At some point though, I'll start writing my own software, once I figure out what I want to do with the data. I intend on communicating the data over the internet... but I need a means of communicating the data wirelessly from the console (which receives the data from the external station wirelessly) to the computer that is going to spit the data onto the internet. Right now I have a clever arrangement with an end table that hides the PC and all the associated cabling and connections to the console. At someone else's house I am at their mercy. They may allow me to put the console somewhere where they are able to view it, but the PC might have to be in the closet or basement. I need to transmit the data from the serial connection on the logger at the console, wirelessly to the serial connection on a PC which will be connected to the internet. Page created in 0.065 seconds with 50 queries.